Albany, NY - April 26, 2013 - Governor Andrew M. Cuomo today announced that Orient Beach State Park, located on the eastern tip of the north fork of Long Island, will reopen on Saturday, April 27, following extensive repairs to damage caused by Superstorm Sandy. 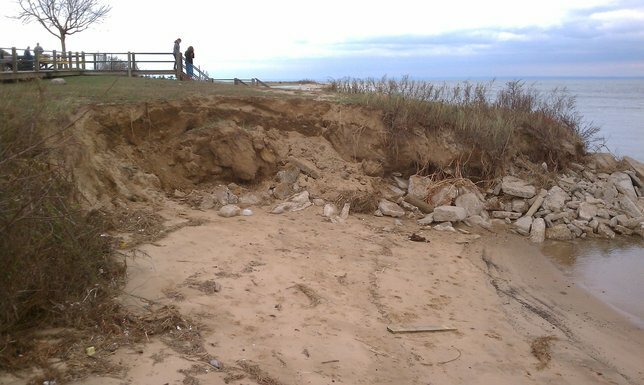 During the storm, the two-mile-long entrance road and Gardiners Bay shoreline sustained serious erosion, and four sections of asphalt roadway were damaged. The buried utilities along the entrance drive were exposed. All of the buildings in the park were flooded. The storm surge and flooding damaged and/or destroyed dozens of trees along the entrance drive and washed a lifeguard shack and picnic tables from the beachfront. With the assistance of the New York State Department of Transportation, the entrance roadway has been rebuilt, and approximately 2,120 feet of the Orient Beach State Parkway has been repaved. Two areas of “rip rap” slopes have been installed to protect the new roadway along the Gardiner’s Bay shoreline. Rip rap slope protection is a layer of stone designed to protect and stabilize areas subject to erosion. Orient Beach State Park is open daily, year round from 8:00 am to sunset. The park is a four-mile long peninsula that extends westerly into Gardiners Bay near Orient Point. The park is a popular recreational facility, known for its picnic area, swimming beach, pavilion, bike path, gift shop, playgrounds, fishing and kayaking. The park is a recognized National Natural Landmark, as well as an Audubon Important Bird Area and a significant habitat for endangered shore birds and plants. Orient Beach State Park welcomes over 350,000 park visitors annually. The North Fork of Long Island has become a popular tourist destination. Visitors to the region enjoy world class wineries, fine restaurants, farm stands, bed-and-breakfast locations, art galleries, lighthouses and the park. Orient Beach State Park is easily accessible by car, bus, bicycle and ferry. The park will open for the first time since the October storm. Park visitors will see minor facility repairs underway, tree pruning, native vegetation replanting and landscaping work continuing during the season. The New York State Office of Parks, Recreation and Historic Preservation oversees 179 state parks and 35 historic sites, which are visited by 60 million people annually. A recent study commissioned by Parks & Trails New York found that New York State Parks generates $1.9 billion in economic activity annually and supports 20,000 jobs. For more information on any of these recreation areas, call 518-474-0456 or visitwww.nysparks.com, connect on Facebook, or follow on Twitter. Subject: LongIsland.com - Your Name sent you Article details of "Governor Cuomo Announces Orient Beach State Park to Reopen Saturday After Repairs to Damage From Superstorm Sandy"